Just Tyres Stourbridge are specialists in budget, mid-range and premium tyres which can be purchased online, delivered or fitted in our conveniently located store. Our experienced team supply and fit tyres for cars, 4x4s and vans, while we're confident we have the right product for you and your driving style. You can find our Stourbridge tyre fitting centre just off the A491 at the Mill Race Industrial Estate, while we are always on hand to offer advice and guidance on all of our tyres. We can also provide a free tyre check. Our confidence in our extensive tyre range is clear to see with our five year warranty, and all of our products have been manufactured to the highest possible standards. We regularly update our special offers, while you can register online for discount vouchers to be used in store. Making an order on our website is simple, and all you need to do is fill in our ‘find your tyres' search box on the homepage and choose between delivered or fitted tyres in Stourbridge. You'll then be provided with a list of results that are relevant to your vehicle, where you can weigh up your options, make your choice and proceed to checkout. If you're not entirely sure on the type of tyre you're looking for then our team is always on hand to offer help and guidance. Appointments for advice and tyre checks can be made at any of our fitting centres, and you can schedule your appointment online. 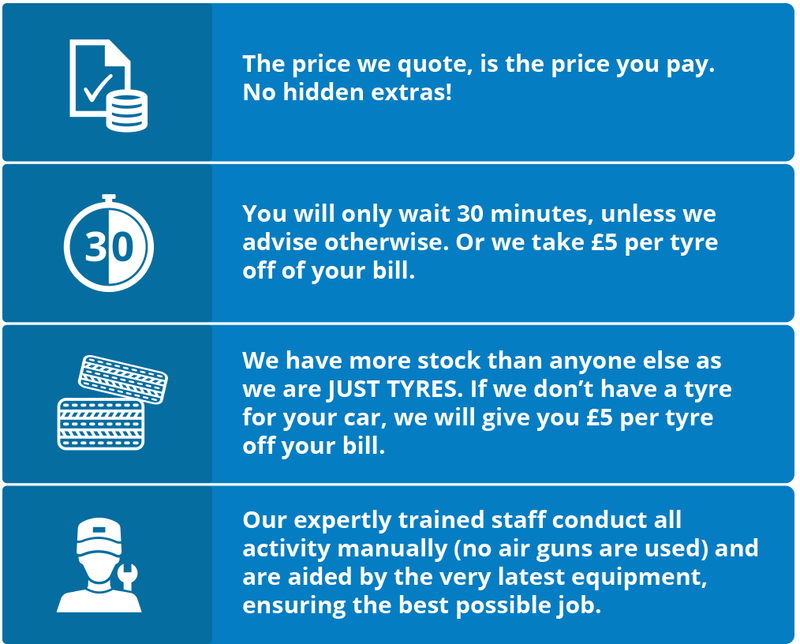 Our web only deals mean customers can be rest assured that their tyres in Stourbridge are supplied at exceptional prices, and you certainly won't find these prices in store. To find out more about our products and services, speak to a member of our team today via email, or by calling us on 0845 456 9903. You can also request a call back or use our online chat service.